Heavy pots with lids like known as Dutch ovens, in many different versions in different countries, have been used in cooking for hundred of years. Also known as casserole dishes, or cocotte in French, with their retro style, they never fail to warm up the look of any kitchen. A Dutch's oven true value, however, comes from its versability as a multi-tasking cooking device, for indoors and outdoors. A Dutch oven is a is a thick-walled with a tight fitting lid. Usually made of cast iron, they can also been amelled in different colour. Although cast iron, and enamelled cast iron, is the tradition, Dutch ovens are also available in stainless steel or aluminium, which makes them a lot lighter. However, cast iron is known to be better at even heat distribution, and generally a heavy Dutch oven is better for browning and braising, as the heavy cover really seals in the ingredients, cooking them faster than in normal pans. 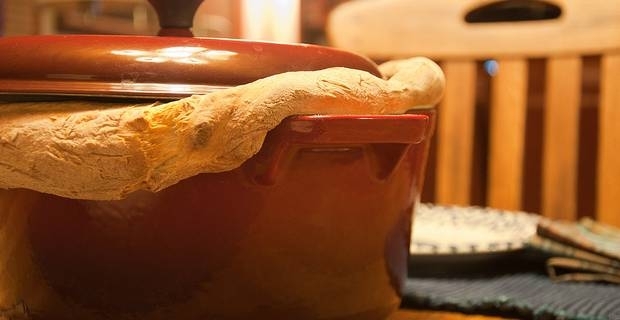 As there are many aspects to consider when choosing a Dutch oven, it is probably better to start by thinking what kind of use you are going to make of them. Dutch ovens are significant asset in any kitchen set up, as they can be used on stovetops for slowcooking, such as casseroles (http://cooking.excite.co.uk/chicken-casserole-recipe.html), stews, roasts. But they are famously suitable for outdoor use: when cooking over camp fires, Dutch ovenscan be used as true baking ovens to prepare biscuits, cakes, bread,pizzas and pies. Also, smaller pans can be placed inside Dutch ovens, quickly to be replaced with another when the firstbatch is done, thus taking advantage of the stable temperature of the oven. It is even possible to stack various Dutch ovens on top of the other, ths making the best of the heat produced, for instance, by a camp fire, or even by the gas or electricity we consume when cooking in our homes.